One of the foremost landmarks of Dubrovnik’s atmospheric Old Town, the bell tower stands at the eastern end of Stradun, the main thoroughfare, and looms over Luza Square. The 31-m (102-ft) stone tower is topped with a stumpy dome and flanked by some of Dubrovnik’s most spectacular architecture, including the lovely Sponza Palace, St Blaise Church and Orlando’s Column. Constructed in 1444, the tower was badly damaged in the earthquake of 1667 and began to lean alarmingly; by the 18th century it had fallen into disrepair and it was not until the late 1920s that repair work began and the tower acquired its present shape and clock, the face of which resembles an octopus and also portrays the phases of the moon. Consequently, very little of the original tower has survived to the present day except the two-tonne bronze bell, which was cast by master metalworker Ivan Krstitelj Rabljanin from nearby Rab Island. The bell is bracketed by two bronze figures – now tinged green with age – known locally as the ‘zelenci’ or the ‘green ones’ and who strike the bell on the hour every hour – their much-restored originals are now on display in the Rector’s Palace along with the original clock mechanism. Luza Square, Dubrovnik. Closed to the public. Best accessed on foot in the pedestrianized Old Town. Get the most out of your stay in Dubrovnik by booking this comprehensive combo out. First ascend via cable car Mt Srđ, the craggy mountain that towers over the city, for jaw-dropping views of the walled medieval town. Then, head back down and go on a guided walking tour of Dubrovnik, strolling its limestone-blanketed streets and learning about the history of some of its most famous landmarks from St Onofrio’s Fountain to the Cathedral of the Assumption. 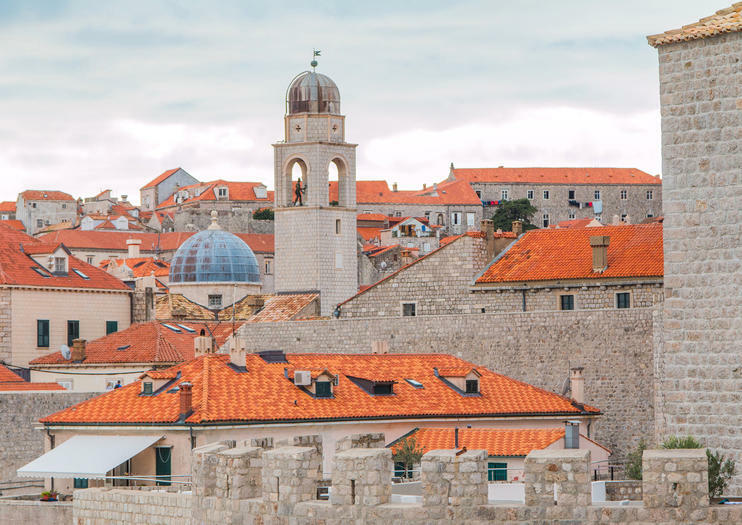 Learn why Dubrovnik is called the ‘Pearl of the Adriatic’ on this tour of the city’s Stari Grad, or Old Town, and its thick centuries old city walls. See the monasteries and churches, the palaces and the burgher houses, learn the history behind them, and stroll the streets with your guide. Hear about daily life in Dubrovnik during the Middle Ages, as well as, during the battles in the early 1990s. Then ascend to the walls, getting great views of the city and the sea. This Combo is a great way to get two tours — of the city and the walls — at one discounted price. First timers, even third timers, should not miss this info-packed walking tour of Dubrovnik. Stroll the limestone-covered streets of Old Town, or Stari Grad, with a knowledgeable guide learning the secrets behind the palaces and plazas, cloisters and cathedrals. Start the tour in the morning, the best time of day to walk the streets of the city. Go from the clock tower to the Assumption Cathedral, traversing the entire Old Town while learning about the history of the place. Combine city sightseeing with a sea kayaking and snorkeling experience on this full-day Dubrovnik Super Saver that saves you 10 percent! Begin the day with a casual walking tour of the city’s UNESCO-World-Heritage-listed Old Town, strolling down the limestone-paved Stradun, the widest street in city of narrow lanes, as well as ancient churches and monasteries. Then, hop in a kayak and do some paddling in the azure-colored Adriatic, heading over to the leafy island of Lokrum. This tour is limited to no more than 20 people. Dubrovnik, that pearl of the Adriatic, has more going for it than towering medieval walls, limestone-clad streets, and friendly locals. There are some seriously intriguing stories behind the legends of Dubrovnik. This tour takes you, your very own lantern in hand, through the streets of Stari Grad, or Old Town, scratching the surface of the city to learn what has really made it tick for the last several centuries. Explore Dubrovnik in a different and exciting way. Visit one of the most beautiful medieval towns on the Mediterranean, Dubrovnik, on a 6-hour tour from Budva. Travel over the border to Croatia from Montenegro to explore the old town with an informative local guide. Highlights include the Franciscan Monastery and Sponza Palace on a tour that includes round-trip transfer from Budva.